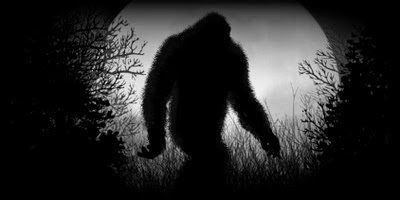 Sasquatch men, remnants of a lost race of "wild men" who inhabited the rocky regions of British Columbia centuries ago, are reported roaming the province again. After an absence of several months from the district of Harrison Mills, 50 miles east of Vancouver, the long, weird, wolf-like howls of the "wild men" are being heard again and two of the hairy monsters were reported seen in the Morris Valley on the Harrison river. Residents in the district tell of seeing the two giants leaping and bounding out of the forest and striding across the duck-feeding ground, wallowing now and again in the bog and mire and long, waving swamp grasses. The strange men, it was reported, after emerging from the woods, came leaping down the jagged rocky hillside with the agility and lightness of mountain goats. Snatches of their weird language floated on the breeze across the lake to the pioneer settlement at the foot of the hills. The giants walked with an easy gait across the swamp flats and at the Morns Creek, in the shadow of Little Mystery Mountain, straddled a floating log, which they propelled with their long, hairy hands and huge feet across the sluggish glacial stream to the opposite side. There they abandoned the log and climbed hand over hand up the almost perpendicular cliff at a point known as Gibraltar and disappeared at the top of the ridge. They carried two large clubs and walked round a herd of cattle directly in their path. The return of the giants to the legendary stronghold of the sasquatch monsters recalls the narrow escape of an Indian at the same spot last March. A huge rock narrowly missed his canoe while he was fishing and looking up, he said he saw a huge and hairy monster stamping his feet and gesticulating wildly. The Indian escaped by cutting his fishing tackle and paddling away. The same Indian declares the sasquatch have twice stolen salmon which he tied outside his house out of reach of dogs. The latest appearance of the monsters was peaceful. They avoided the trails usually used by the people of the valley and molested neither cattle nor human beings.